There’s been a few phonomena sweeping the wider Australian tech community of late, and I just wanted to tell you about one that I managed to get in on. Officially part of the the HP ProLiant MicroServer series, the N36L is a small box with a whole lot of potential and even more potential. Officially, it’s designed to satisfy the storage requirements of small to medium businesses by providing them with easy, expandable storage in a convenient form factor. Officially, the base configuration comes with four non-hot-swappable drive bays for 3.5″ drives, a dual-core 1.3GHz AMD Athlon II Neo processor, 1GB of ECC RAM, and a stock 250GB drive to get you started. Unofficially, the MicroServer is the best piece of tech I’ve bought in recent memory — and as my parents, friends, and even the local postie will tell you, I buy quite a bit of tech. It all started when I was reading a thread about it on one of my favourite forums. 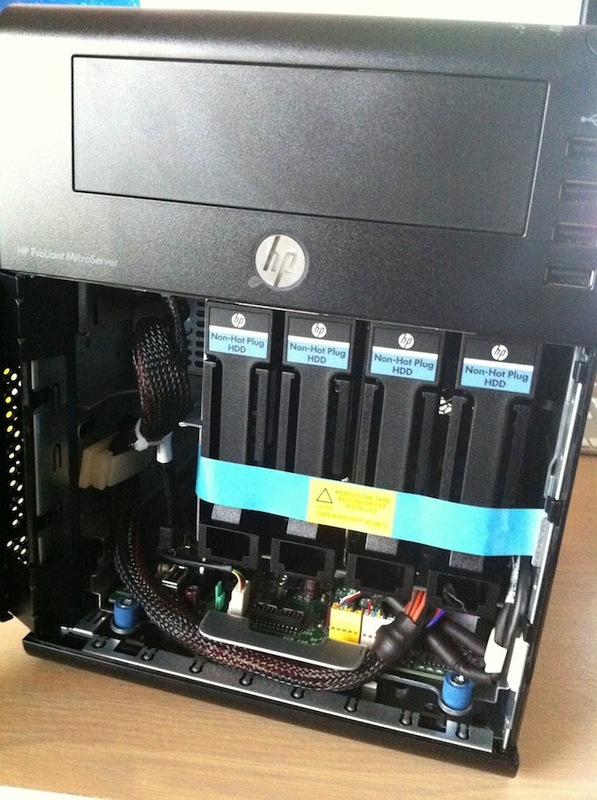 Forum member Brains posted up a deal a HP reseller were running that offered one of these MicroServer machines in the base config for a bit more than $200. Long story short: I put an order through with that reseller, waited a while, eventually received an email saying stock was delayed, waited a little longer only to be rewarded with another “stock delayed” email a few weeks later. By that time HP themselves were offering the original deal for the second time ($199 delivered to my door), so I requested a refund with the reseller and placed an order with HP. A few more weeks later, and the MicroServer arrived. Now the only question that remained was what the hell I was going to do with it. Up until now I’ve been storing all my media on individual drives. Buy a drive, stick it in my PC, share it over the network, and fill it up. Rinse, repeat. This scheme worked pretty well for a while, but I knew I couldn’t keep it up forever (I was fast running out of SATA ports), plus there were many aspects of this storage system I wasn’t quite happy with. For one, my PC uses about ~200W on idle; leaving it overnight is just asking for a lecture about power bills. Downloading stuff overnight can be done by my Mac, but even that isn’t optimal. So, what I am doing with my MicroServer? First and foremost: it’s a storage box, my very own NAS. I’ve filled it with 4x 3TB drives, maxed out the memory with 2x 4GB sticks of ECC RAM, and added in my own 500GB drive in addition to the stock 250GB that comes with it for a total of six drives. In terms of software, it’s currently running those drives in a software RAID 5 under Ubuntu 11.04 with the help of mdadm for RAID management, giving me roughly 8.5TB of usable space after file system formats and what ever else. I’m currently serving the array across the network using SMB, and I get decent enough transfer speeds across my Gigabit network, roughly 75Mb/s stable. It’s also currently serving a Deluge daemon accessible though a web user interface, running a SABNZB+ instance also accessible through a web UI for Usenet downloads, leveraged by Sick Beard, and finally, because all my media is now in the one spot, on a machine that stays on 24/7, a Plex/Nine installation so I can access stuff from my iOS devices (the dual-core seems to transcode 6mbps 1080p streams on-the-fly just fine). Oh, and it’s also hosting a temporary Minecraft server for myself and a few friends. All this on a machine that uses about 40W idle, even when loaded up with 6 drives and 8 times the amount of original RAM? Like I said, the HP MicroServer is one of my best tech purchases yet; it perhaps wasn’t all that cheap after all the upgrades, but still cheaper than a Drobo or similar 4-bay NAS boxes, and quite a bit more capable. I’ve heard other people that have also had success with putting Solaris on it for ZFS, FreeNAS for something a little more lightweight (but still equally as capable), and some other, slightly crazier dudes running all sorts of ESXi virtualised environments, stuffing 4x 2.5″ drives in the optical drive bay, putting RAID cards in them, and even taking a dremel to their machines in order to stuff yet another 3.5″ drive below the optical bay. Me? I’m not quite so serious, but my little MicroServer still does everything I want it to do. Expect a few more posts on this in the coming days, and let me know if you have any other questions. Further reading to get you started: the insanely long thread on Overclockers Australia about it. Six drives in a four-bay MicroServer?